Today was Day #2 of Chocolate and Cashews Theme Week. 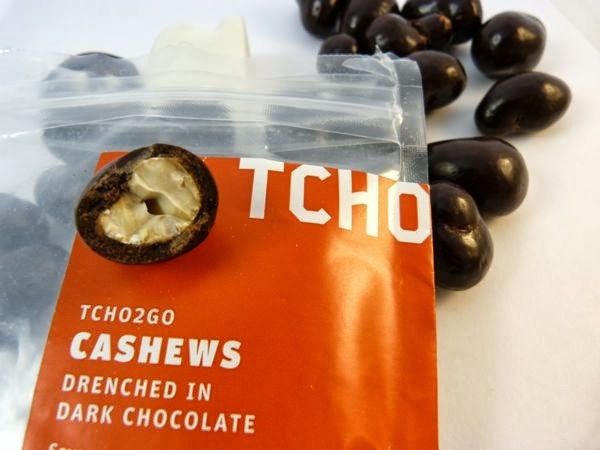 I enjoyed these Cashews Drenched in Dark Chocolate from TCHO (San Francisco, CA). The flavor of the cashew nut is delicious, sweet and subtle -- and it is to TCHO's credit that these honey roasted, whole cashew nuts were not drowned out by the dark chocolate covering. I always feel the temptation to add a little extra salt (applewood smoked salt worked nicely) to savory-sweet treats like this that err on the sweet side. 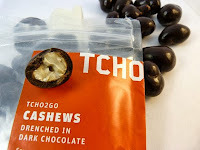 But, I believe most people will like these mild, crunchy "TCHO2GO" nuts with flavorful dark chocolate as is.